It's been a productive year for Dave Matthews, and not just because his wife, Ashley, is expecting twins in September, soon after the Dave Matthews Band wrap their summer tour of stadiums and amphitheaters. 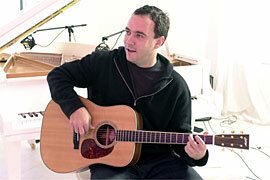 He also created the songs for the latest DMB album, ''Everyday,'' with producer Glen Ballard in an intense 10- day spurt. This followed the breakdown of recording sessions for a nearly completed but unrelesed earlier album, which thanks to Napster has been widely disseminated among the faithful. EW.com recently spoke to the 34-year-old rocker about his impending family and new musical direction. I hear you had to cut your tour shorter than planned because of the pregnancy. We had to do some compressing. But it's pretty much at the end of the [planned] tour that Ashley is due. And twins tend to knock a little early, because things start getting crowded, I guess. I'm so excited about it. Everything tends to fall onto its correct rung of substance when someone dies in your life. And then birth is another one which I think will put everything in perspective even more. ''Everyday'' has a certain lightness of spirit about it, but there's still some reflection on mortality. And your unreleased album is full of songs that deal with death. Is that partly because of how you were feeling after your stepfather died? Yeah, that was right in the middle of the [unreleased] album. And also my uncle died, who was my godfather, who I loved dearly. I didn't tell him that enough. It just reminds us: Don't be fickle. Or if you are fickle, be very aware when you're being fickle! Listening to the unreleased album, I agree with fans who are claiming it's some of the best stuff you've ever done. But the accumulated weight of it is so dark that I can also empathize with your decision not to put it out. How did you feel when that whole project ended up on Napster? First of all, surprised, because I didn't know how it got there -- and still don't know how, and don't want to venture a guess. It was frustrating. But at the same time, what's done is done. It's out there. I guess one side of it is that lyrically there's a lot of unfinished stuff, a lot of rambling just to fill the air, which is I guess in a way kind of cool. Although there's some of the best lyrics I've ever written in there as well. So in your mind it was by no means a completed album. No, I didn't think it was completed at all. But I think ''Bartender'' is a f---in' massive sounding song. And ''Digging in a Ditch'' and ''Busted Stuff'' were all good as done.